They captivate me. Glimmering golden alongside the road, making the most ordinary of routes feel like a wondrous journey. Wildflowers budding and blooming anew, proclaiming spring’s arrival even if the wind still blows cold. They draw me in every year. Their blooms call to something in my spirit; I don’t have to stop, but I don’t want to keep driving. I can’t go on without getting closer. More than once recently I have pulled my sensible car over into insensibly tall grass, stomping and marching my way through the wild stalks to achieve my goal: a fresh golden bouquet to take home with me. What I never anticipate, though, is that the flowers – beautiful and perfect from the road’s safe distance – come with some of nature’s imperfections, too. To get to the beauty, I step carefully through muddy spots…swat away the gnats and mosquitoes…duck and dodge dragonflies…sneeze and cough as I shake off the pollen. As I approach them, they’re still beautiful…..but suddenly appears all of that other stuff, too. At some point, I always have to stop…look at what first compelled me to stop the car in the first place…and decide if it’s worth the trouble. I have to decide if the nuisance will outweigh the blessing, or if I want the beauty of the flowers enough to endure the less-than-beautiful things that come, too. Words ring in my head from a history or English class somewhere in my past: the ends justify the means. 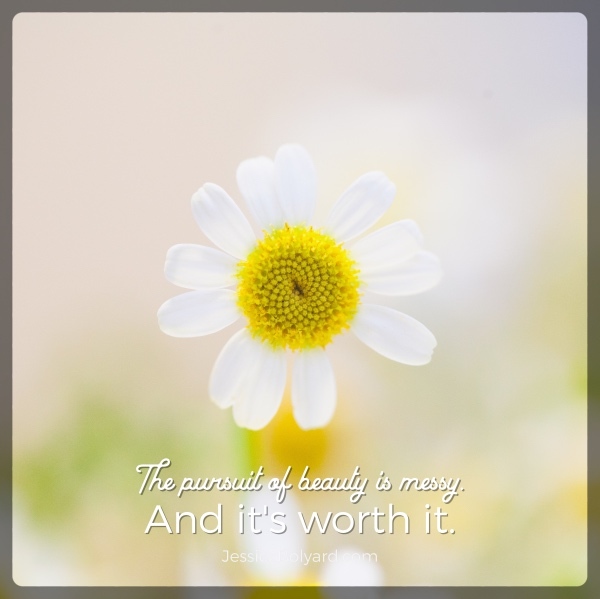 If I should I opt for beauty, there is work to be done. I have to push my way through the ugliness to place myself in the beauty. 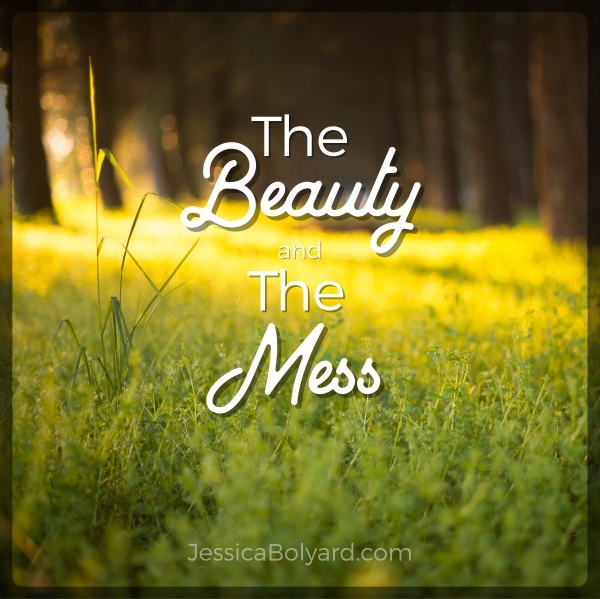 I have to look past the mess to draw the glorious into my life. 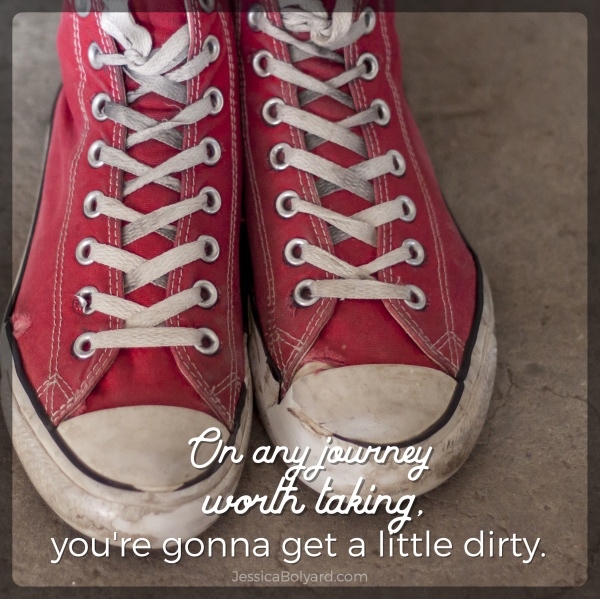 If I want to invite beauty into my world, I’ll probably have to get a little bit dirty in the process. And the other day, as I trudged through more tall grass with my prize (and convinced that I had ruined my shoes and given myself bronchitis in the process), I realized how this quest for beauty…this passionate pursuit of the glorious….this quest for more of what God has for us…it stretches its fingers into so many aspects of this otherwise ordinary life. This relentless drive toward the beautiful isn’t just found on spring mornings on back country roads. 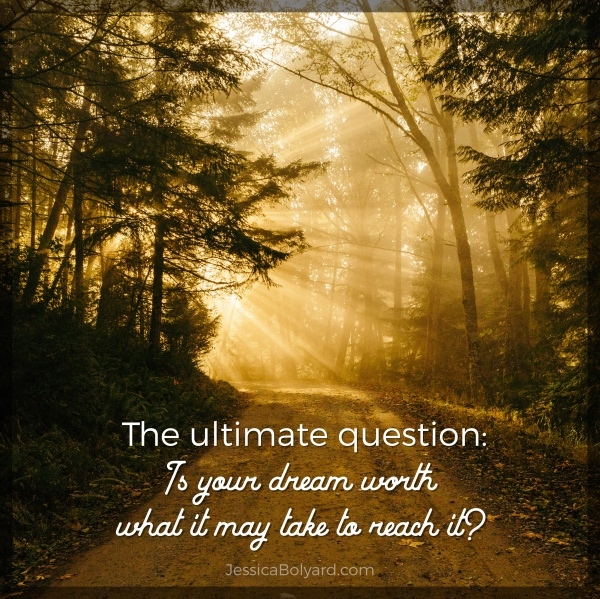 It’s found everywhere in life, and resonating through it all is one defining question: Is the dream – the beautiful dream, whatever it is – important enough that we are willing to bear the mess in order to get there? And from where I sit today, that choice is glaring and will not be ignored. Here, in this neverland between what I was and what I dream will one day be, I see a thousand choices nestled into my path. Will I pursue new friendships even though those friends may hurt me…challenge me…move away? Will I choose to love unsparingly, knowing that loss is a possibility? Will I pour myself relentlessly into a dream, not knowing if or when it may ever come to pass the way I hope that it will? Will I write transparently, following the path laid before me when God created my innermost parts, aware that scrutiny and criticism will come? Ultimately, every individual choice points back to the original question: will I continue to choose the beautiful, in spite of the messy? Will I press onward toward the glorious despite the difficulty I may have to endure on the way? Life has so many hard things. Easy days have a way of becoming messy and ugly and complicated, and everything would be so much easier if we turned around and ran in the other direction. But friend, there is also beauty. There are also those things that make this life so beautiful that even when you have mud on your shoes and fresh mosquito bites and a cough that won’t quit, you keep walking on because you want – no, you HAVE – to be as close as possible to the beauty of your dreams. And today, as I admire the modest bouquet in the glass jar on my kitchen table, I realize that things of real beauty are always worth getting a little messy. So whatever beauty you’re seeking, press on through the mess. If the beautiful thing you’re pursuing is a restored marriage, trudge through the hard work of forgiveness to get there. If you’re seeking community and fellowship, make your way through the hard stuff of vulnerability to find it. If you long for your children to grow into leaders who do incredible things for God, push through the hard days of discipline and hard choices and going against the grain. If you’re seeking the fullness of God’s plan for your life, lean in and let Him work out the messes within you so He can take you there. The beauty we seek is worth what it takes to get there. Always. Every time. Any journey worth taking will get our shoes a little dirty, and we’ll come out on the other side more tired than we expected. But if we are faithful to press on in the hard parts, things of unsurpassed beauty will be ours. 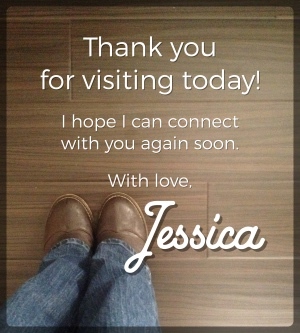 Jessica, this is my first time here but wow this is so true!